I'll admit that I'm not totally impartial in my selection of It's About Time as this month's Pick Hit. 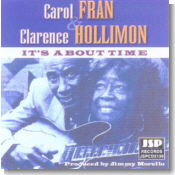 Carol Fran and Clarence Hollimon have been very good friends of the Phoenix Blues Society for many years, and we were all devastated at Hollimon's untimely death just a few weeks before this album was released in May. But our relationship with Fran and Hollimon doesn't take away the fact that It's About Time is one of the best blues releases of the year. Producer Jimmy Morello, who has overseen quite a few good recordings for JSP, assembled a top notch backing band, wrote and arranged all of the material, and extracted superb performances from both Fran and Hollimon. The 11 cuts on It's About Time are all extremely satisfying, and will leave you wanting to hear more. Fran was not feeling well during the recording session, and appears on only four of the cuts. That left more of a burden on Hollimon, who responded by putting his heart and soul into these recordings. It's About Time is a fitting tribute to this vastly underrated by influential musician. Every aspiring blues guitarist should get this album immediately and listen to it daily. The CD opens with a fine vocal number from Fran, the mid-tempo shuffle "Texas Home," on which her booming voice gets a little earthier than usual. During their 17-year partnership (and marriage), Fran's vocals and Hollimon's guitar work have fit together like a hand in a glove. His guitar work fills in beautifully around the vocal parts on this and many other songs on It's About Time. Hollimon's Texas roots come out on the the first of four instrumentals, "Jumpin' With The Gristle," as his T-Bone Walker-style guitar fronts the tight horn section of Jonny Viau and Troy Jennings. An even stronger instrumental is another horn-dominated number, "Herky Jerky," as Hollimon leads the band with more fine guitar work. Fran hails originally from Louisiana, and "Put The Blame On Me," has a heavy New Orleans flavor. Tom Mahon contributes the requisite piano, while Jennings' baritone sax solo is reminiscent of the late Lee Allen's best work on the classic early Fats Domino recordings. Hollimon seldom stepped up to the microphone during his career, preferring to focus on playing guitar behind other singers. But his few vocal performances are to be treasured, and on this album he does a nice job on the mid-tempo Jimmy Reed-style blues "I Can't Go For That." The partnership of Fran and Hollimon is back together on the slow blues "No One Will Listen," as Fran booms out her lines between tasty licks from Hollimon. The contrast between her "no holds barred" singing and his restrained guitar work is stunning. With Fran not able to complete the session, producer Morello called on another JSP artist, the L.A.-based singer John Marx, to fill in on three numbers. The best of his performances is on the driving blues of "Rock Bottom." Our last glimpse of Hollimon's guitar genius comes on the closing number, "You Got Troubles," as he weaves intricate guitar patterns around Marx's vocal lines. Clarence Hollimon is one of the finest guitarists in the history of recorded blues. He will be sorely missed. But It's About Time is a fitting tribute to his life. Goodbye, Clarence. For more of Hollimon's guitar playing, check out Jimmy "T-99" Nelson's album in this month's Flashback section.